“Messe” is a) divine service, b) a certain type of musical composition and c) a place for trade and exhibition. Over a series of four nights this collaboration in the extraordinary former Soviet Pavillion presented a work around three completely different spheres – religiousness, art and economy – through music, dance and light in the quasi-ecclesiastic architecture. 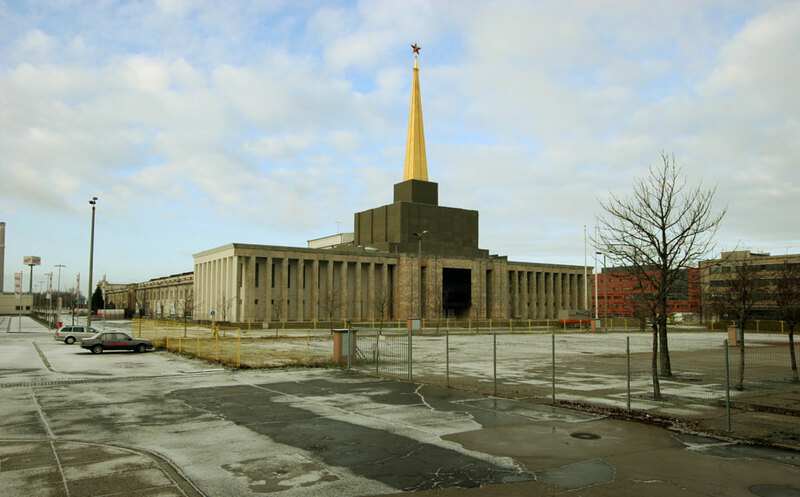 The Soviet Pavillion corresponds in the cityscape with the Russian church that is in the immediate vincinity to the German Library and to the Bio-City Leipzig and other modern landmarks of Leipzig. The huge sacral pillored hall is a historic monument and symbolizes not just the ambivalent history of the secular trade fair but also the conflicting role of the former USSR for the former GDR and what corresponds with this political model today: USA, China etc. The soundtrack attempted to offer a picture of society through voice and harmony. Following a theme of power and engagement with political ideology, I used historical references to requiems and masses, moving through a series of moods and textures that sought to present an overall image of authority and control in a seductively organic fashion.